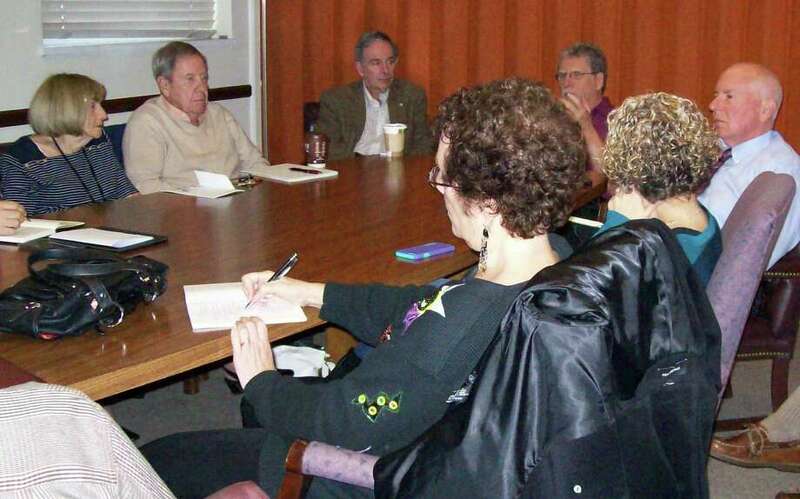 Barons South Committee members and town officials attended Friday's meeting of the committee in Town Hall. The Baron's South Committee met Friday morning for the first time since the Planning and Zoning Commission in late September rejected a text amendment that would have permitted construction of a 135-unit senior housing complex on 22.7 acres of town owned land. The P&Z specifically denied a proposed revision to a previously approved amendment that would have lowered the number of so-called affordable units at from 60 to 20 percent in senior housing projects built on town-owned property -- the only application that would be affected was the Baron's South project. The revision was made, in large part, to satisfy the Board of Finance's desire that the complex generate more revenue than initially proposed. First Selectman Jim Marpe, who attended Friday's committee meeting in Town Hall, said they were disappointed by the rejection. "Nevertheless, my administration remains committed to pursuing senior housing," he said. "We have to see how we can meet zoning and other issues related to that." He said that, at the same time, the project developer Jonathan Rose Cos., based in Stamford, also intends "to pursue the plan and modify its proposal." "All three here today voted unanimously on a memorandum of understanding and we remain committed," said Selectman Avi Kaner about himself, Marpe and Selectman Helen Garten. "This would have been a triple win for seniors, taxpayers and the environment," he said. He said that, while the P&Z rejected the proposed text amendment in a 6-1 vote, "they said they are in favor of senior housing." Kaner said "one mistake we made was to put together what we thought was a perfect proposal" and then take it to the commission before that group had any input. But, Yvonne Senturia, committee member, said, "We tried to get them," referring to P&Z members, but they felt it would prejudice their votes. One way to get the commission involved, Kaner said, would be to submit a pre-application for the project for their review. "We need to figure out a way to do that," he said. Town Attorney Ira Bloom said that a pre-ap is allowed to be submitted by state law, but it assumes there is an application. "Why didn't we do this before?" asked Marty Hauhuth, Baron's South Committee co-chairwoman. There are other approaches that can be taken with the application, including one that would not require any text change -- just trying to design a plan that conforms with existing regulations, said Ken Bernhard, committee member. But, he said, it could mean a smaller project and less revenue coming to the town. Some commission members said they shouldn't attach "a money burden" to the housing proposal. Members also agreed that criteria needed be set concerning private versus public funding for the project. Pros and cons for each were discussed. They also want to keep the amenities, a cafe, pool, and gymnasium, included in the a common annex building included in the proposal. A suggestion that portions of the Baron's South property be sold off prompted Garten to say "there are complications" if that were proposed because "other people are now involved." Hauhuth said committee members should bring a list of "things that are important to us" to the next meeting. Then, she said, they would seek a proposal from the developer. Marpe said he had gathered enough information from the meeting to "at least begin a dialogue" with the developer. "Now I have some direction and I can give them some feedback," he said. No date for the next committee meeting was set. The housing complex, in the works for years, was planned for property between Imperial Avenue and South Compo Road, south of the Route 1. Plans called for it to be linked to the existing Westport Center for Senior Activities to share some facilities and programs.